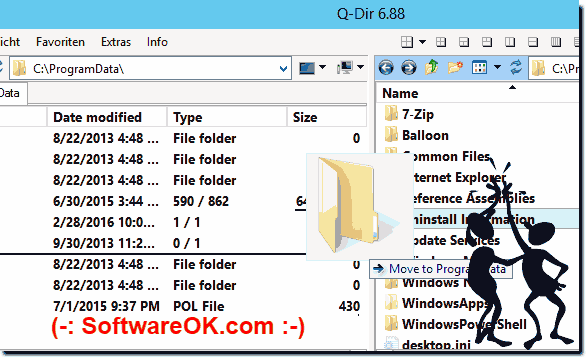 You can easy force to move or to copy the data while dragging in each Explorer View of Q-Dir, Is like drag and drop in MS Explorer! Please read also this: ► ... Color filter only *.mp3! ► Default bold font is killing my eyes! (Image-1) force move or copy of the data while dragging! Q-DIR - FAQ-49: How can i force move or copy of the data while dragging? Oh yes the old Occasional problems with *.qdr files. The icon is now red not blue Content / Solution / Tips: 1. The ICON change in Q-Dir 2. How can I Copy a file from one folder to another *without* moving the file from its current folder? If I drag the file, then it moves it. And that is what I do not want. Thanks.